In later years, Waring Street became home of the Northern Ireland War Memorial and the Royal Ulster Rifles Museum. It suffered greatly in the Belfast Blitz. Photographers from the Belfast Telegraph captured the aftermath of the Belfast Blitz in 1941 when Luftwaffe bombs devastated the Waring Street area. Belfast Telegraph Photo: AR 179. 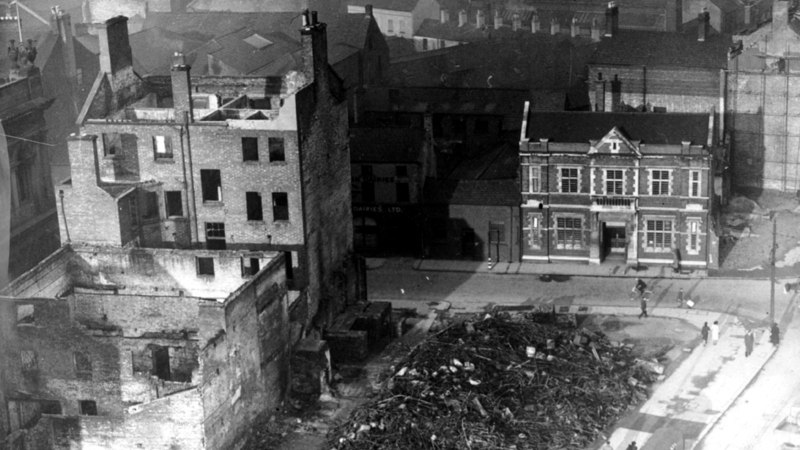 The corner of Waring Street, Belfast, Co. Antrim at the junction with Victoria Street showing the destruction caused by the Belfast Blitz on 4th-5th May 1941. Photo taken from the top of the Albert Clock Tower. If you enjoyed this post on "Waring Street, Belfast, Co. Antrim", please share with your friends and followers.